Keramag Vitalis basins and toilets are specifically tailored to the needs of people with disabilities. 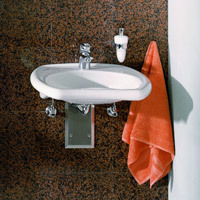 This means that Keramag Vitalis accessible basins can also be used by wheelchair users without any problem. The integrated front grip rail makes it easier to move closer to the basin, while the ergonomic basin indent ensures the optimal use of the basin. The Keramag Vitalis WC has also been specially designed for people with restricted mobility and, thanks to the projection of 70 cm, also allows wheelchair users a comfortable use. Choose between wall mounted and floor standing WCs. We also recommend the support handles from Hewi also to be found at Skybad.